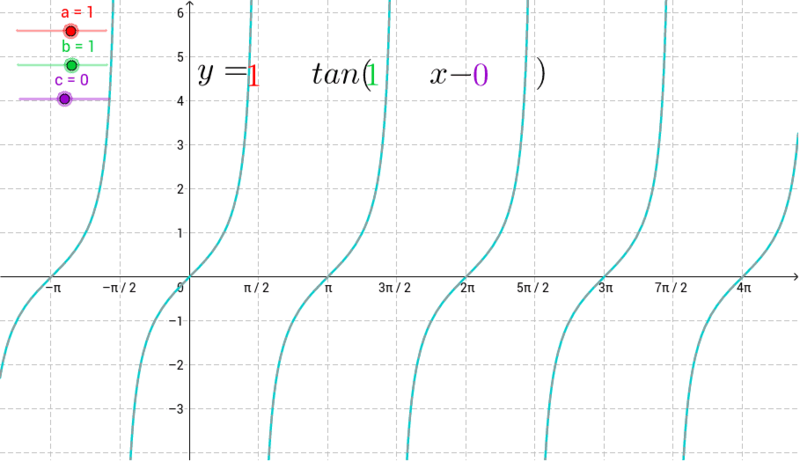 This is the graph of y = a*tan(b*x -c). At the base level, a and b = 1 and c = 0. 1. What happens when a > 1? 0<a<1? -1<a<0? a<-1? Finish the following statements: When |a| < 1, the graph gets _______. When |a| > 1, the graph gets _____. When a is negative, the graph _______. 2. What happens when b > 1? 0<b<1? -1<b<0? b<-1? Finish the following statements: When |b| < 1, the graph gets _______. When |b| > 1, the graph gets _____. When b is negative, the graph _______. 3. What happens when c > 1? 0<c<1? -1<c<0? c<-1? Finish the following statements: When c is positive, the graph _______. When c is negative, the graph _______. 4. Find at least 3 ways to get the graph to map to itself. Turn on the base map to check.